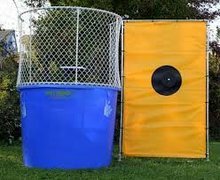 Dunk tanks are a great American classic! These tried and true attractions have proven themselves to be excellent for events of all kinds; school carnivals, church fundraisers and so much more. 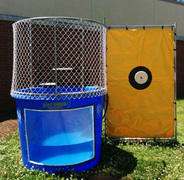 Whatever your event, a dunk tank is an excellent choice to get the crowd lining up for fun. Browse the selections below and click on the image or "More Info" link for additional information and to make a reservation.